Apple desserts are my all-time favorite.Whether baked in a pie dish, wrapped in a tart, or deep fried into rings, I love a freshly chopped apple sprinkled with cinnamon and buried in a flaky crust. That’s why this dessert is a home run at our house. It’s piled high with fresh apples and baked in a cast iron skillet to create a perfect pastry that’s baked to a beautiful golden brown. 1. It’s filled with apples. 2. It’s baked in a cast iron skillet. 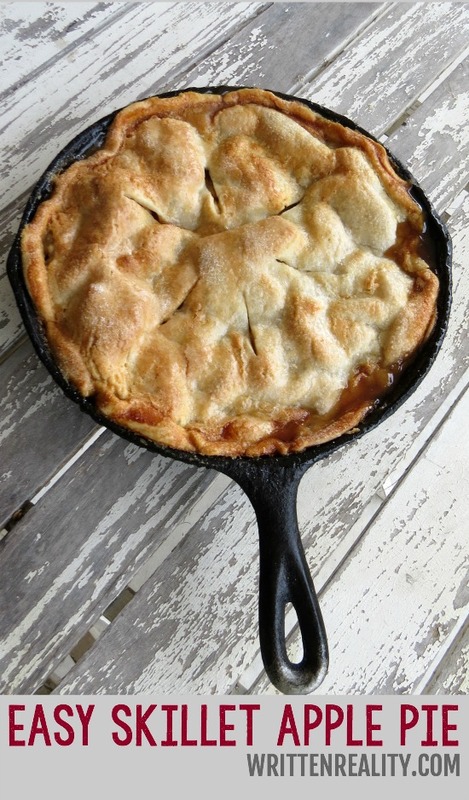 With that, this skillet apple pie recipe sings my sweet comfort story. And along with its magical mix of cinnamon and brown sugar, it’s a go-to dessert in the Smith House and an all-time favorite to enjoy every fall. Well, not just fall for us. ‘Cause we like it with a little vanilla ice cream all year long. I’m not sure why, but for me, apple desserts remind me of home cooking and comfort. And if there’s a choice between an apple pastry or some other dessert, I’m choosing the pastry. So I’ve created plenty of apple tarts and fried pies at the Smith House. 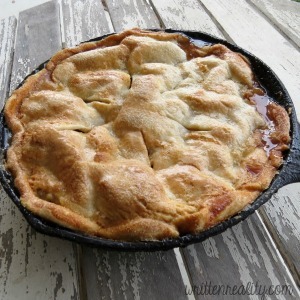 But I must admit this Skillet Apple Pie deserves the blue ribbon over them all. Thankfully, it’s a super easy recipe.By using a refrigerated pie crust, you basically chop up the apples and throw it all in the pan. It can’t get much easier. And the wonderful mix of Braeburn and Granny Smith apples creates the perfect bite. Hungry, yet? Here’s how I like to make mine. Toss chopped apples in 3/4 cup of granulated sugar and cinnamon. Melt butter in skillet then add brown sugar. Allow brown sugar to heat until dissolved. Remove the skillet from the heat and place one of the pie crust in the bottom of the pan. Add apple mixture then top with remaining pie crust. Whisk the egg white to a foamy consistency and brush across the top of the crust. Sprinkle the remaining granulated sugar across the entire pie. Make sure to cut a few slits in the top for steam to escape. Bake for about an hour or until the crust is a golden brown. Del would love me if I made this. 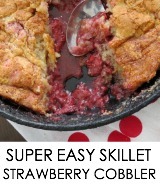 Thank so much for sharing this simple easy Apply Pie recipe. I’m going to have to surprise him with it one day. yes- Daniel is one happy camper when I bake this one– it is sooooo good! Apple pie is my favorite, and I’ve been itching to find excuses to use my not-so-recently-acquired cast iron pan! 😀 Can’t wait to try this out! Now I need to get a cast iron skillet! It looks so easy! Wow! Can you say yum?! I cannot wait to go apple picking this season and come home to make this! Looks yummy! Can’t wait to try this! I am definitely digging out my skillet! This looks delicious! Thank you for linking up with us at Tickle My Tastebuds Tuesday last week! I am featuring you this week and would love if you would stop by and link up more yummy recipes! Yum! I love this idea. I need to go apple picking right away! You can never go wrong with apple pie in my house. I love the taste and flakyness of the crust. I love that you use a combination of apples. It gives the apple pie flavor more depth. You are so right, Barb– the mix of tart and sweet apples is a perfect combo in this pie. 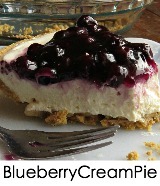 Wow, this PIE IS GREAT! This apple pie is the perfect dessert– the family usually loves apple pie with a serving of ice cream, but this one doesn’t need anything extra– it’s so good! This looks absolutely delicious! Thank you so much for linking up at Tasty Tuesday! Your recipe has been pinned to the Tasty Tuesday Pinterest board! Please join us again this week! I love Making pies in my cast iron. They just taste better. Time to make some apple pie! I’m with you– cast iron is always best choice! I love apple pie and this is such a cool way to cook it! Your skillet apple pie has been pinned and is being featured on The Pin Junkie! I love apple pie and this one looks amazing and easy. Can;t help but love that!! Thanks for linking up with the Merry Monday Link Party! 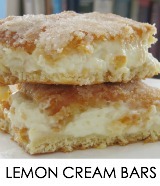 This looks so good, I definitely want to try making it this weekend. And I love the rest of your site, too. A quick question: i’m trying to visualize the steps, and i’m not sure: do you just place that first pie crust right on top of the melted butter/brown sugar mix? and then it kind of seeps up into the apple part of the pie itself during the baking? and do you have to serve it in the cast iron or is the bottom solid enough to transport to a pie dish or something like that for travelling? I’m worried it might be too soupy to move out of the skillet. It does have the juice from the apples, but if you chilled it or left it overnight, it may firm up enough–not sure.